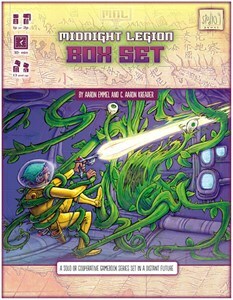 In Midnight Legion, you are an android agent who has been activated after hundreds of years of stasis. Your scheduled mission is still centuries in the future, but your underground base has been invaded and you must defend it! Unfortunately, it will take time for your memories to return. As you fight, trick, or sneak your way up from the lower levels to the surface and your memories begin filtering back, you realize that your mission is not what you thought it was - and you may not be who you think you are. The world has changed since you were put to sleep, and you will need to decide whether you are still willing to follow your ancient orders, or whether you are ready to set a new future in motion. Designed for two-player and solo play, the Midnight Legion Box Set comes complete with a Gamebook, a Memory Book, a Game Map, and two Custom Dice.